Turnkey video wall and digital signage solutions from Lanner incorporate Matrox C-Series multi-display graphics cards. 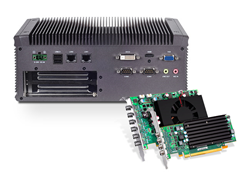 Lanner Electronics Inc. today announced the release of the LEC-2284, a high-performance box PC powered by Intel®'s 4th generation Core™ i7/i5/i3 CPU with QM87 PCH. The LEC-2284’s quad-core or dual-core processing power comes from Intel®’s Core™ i7-4700EQ, Core™ i5-4400E or Core™ i3-4102E processor, all three demonstrate significant performance gain over Intel’s 3rd generation Core™ processors (Core™ i7-3612QE/3555LE, i5-3610ME and i3-3120ME). Given its rich I/O and expansion options, the LEC-2284 is positioned as an ideal solution for digital signage. In terms of storage and expansion, the LEC-2284 offers dual 2.5" HDD/SSD drive bays and one mSATA socket; expansion is made possible via the included PCI, PCI Express x8 and mini-PCIe socket with SIM card reader. Furthermore, the LEC-2284's Industrial design, 9 VDC to 30 VDC input range and -10°C to 50°C operating temperature ensure its availability 24/7. Its other notable features include 16GB DDR3L SODIMM memory, dual COM ports, dual serial ports, dual USB 3.0 ports, 4 USB 2.0 ports and wall/VESA/rack mounting options. Lanner now offers two turnkey video wall solutions incorporating Matrox C-Series™ multi-display graphics cards. These new systems are designed for HD and 4K digital signage and video walls. Available in configurations designed for up to six displays, the LEC-2284 is available with Matrox C420 or C680 in a pre-tested and certified configuration, and provides maximum power and performance in an Industrial Ruggedized Platform. Matrox C-Series multi-display graphics cards provide dual-, triple-, quad- and 6-display configurations up to 4K and feature 2 GB of on-board memory plus secure mini DisplayPort connectivity. The cards come bundled with Matrox PowerDesk™ for Windows desktop management software for easy configuration and control of multi-display setups including stretched or independent desktops, clone mode, pivot, bezel management and edge overlap. Lanner Electronics Inc (TAIEX 6245) is a world leading provider of design, engineering and manufacturing services for advanced network appliances and rugged applied computing platforms for system integrator, service providers and application developers. For more information, visit http://www.lannerinc.com.